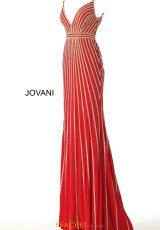 Look like an Egyptian goddess in this Jovani prom dress 45898. Featuring a V-neckline with thin straps and a belt to help accentuate your waist. Showcasing a fitted jersey silhouette with a stunning beaded overlay that is shown in a line design that will make your body look amazing. Shop for more styles like this at Peaches Boutique in Chicago.